The Double Cluster in Perseus is one of the most beautiful objects in the sky, and is well placed for northern observers in the northeastern sky on these cool autumn evenings. One of the greatest mysteries in astronomy is how CharlesMessier missed the Double Cluster in Perseus. In his catalog of objects thatcould be mistaken for comets, he included all the brightest deep sky objects,but somehow overlooked the Double Cluster. So, just because it doesn?t have an?M? number, don?t you do the same, as it is one of the loveliest objects in thesky, a fine sight in either binoculars or a small telescope. You don?t need to know where Perseus is to find the DoubleCluster. 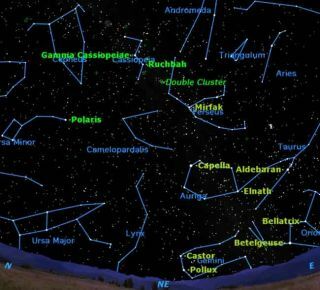 Go out on any evening this month and locate Cassiopeia: a distinctive?W? of 2nd magnitude stars right across the pole from the BigDipper. Use the two stars Gamma and Ruchbah in the middle of the ?W? aspointers towards the Double Cluster. In binoculars, you will see two glowing balls of stars; ina small telescope these will resolve into hundreds of individual stars. These two clusters of stars are a true pair, located atabout the same distance from the sun, 7,000 light-years, and are about the sameage, 10 million years. Despite their common location and history, they arerather different in appearance, in terms of the density and concentration ofstars. Most of the stars are bluish white, but there are a number of yellowstars scattered through the clusters to make them appear colorful. If you continue to sweep with binoculars beyond the DoubleCluster you will reach the Alpha Perseii Cluster. This is one of the closeststar clusters to the sun, only 600 light-years away. It is very large in size,overflowing the field of any binocular, and its members are mainly identifiedby? their shared motion through the sky. For that reason it is sometimes calledthe Perseus Moving Cluster. Despite being very large and containing many bright stars,this cluster is not well known among amateur astronomers, perhaps because it istoo big to view with a telescope. It is one of the objects which is best viewedwith binoculars or the naked eye.